Mobile communication electronics such as programmable two-way radio and data transceivers, vehicle location systems and other microprocessor-controlled devices require clean and steady DC input power. Their sensitive circuitry is highly vulnerable to voltage drop from engine start, noise and line spikes from alternators and motors, and conducted noise from various other electronic devices. NAV-PAC prevents all of these problems. 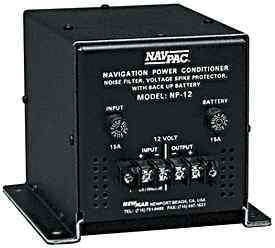 • Provides supplemental voltage/battery back-up for up to 15 min. • Remote monitor panel included. protects battery from total discharge. Certified by DOT and IATA for shipment by air.